Started in 2000 when daughter was born. Took a class at a local quilt shop. About 20. About 4 UFOs. 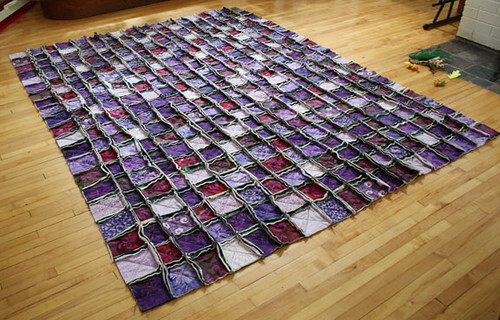 1 million quilts that I want to make! Describe your first quilt. (a photo would be nice, but is optional). A pink pastel traditional pieced crib quilt that I made for my daughter. My Teddy Bear appliqué, hand quilted wall hanging – all done by hand- from the book Alphabears by Linda Hohag. My basement sewing room or upstairs at my kitchen table. I far prefer the latter! Coffee is a must! Sometimes I listen to the radio. I keep my stash in rubber totes. I have way too much so am trying not to buy more for a while. I love working with my hands and making things. 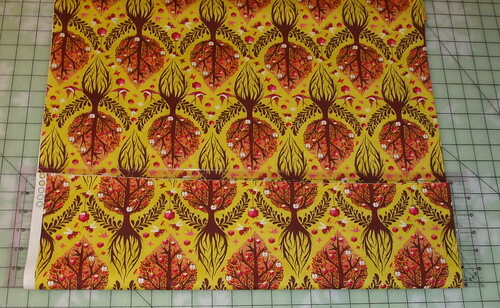 I love handwork—hand turn applique or hand sewing the binding on. 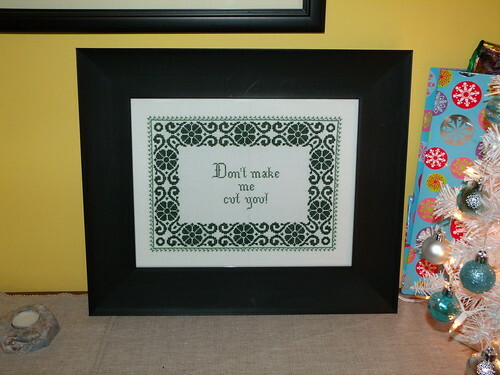 It is hard to get started or make time to quilt because there are always other things to do like basic housework, work, paying bills, grocery shopping, mowing the lawn, caring for a child, etc., etc. 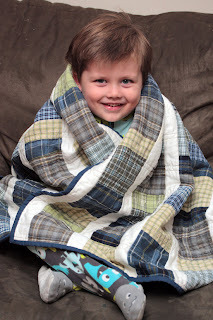 What is one (or more) quilt technique you would like to learn or are afraid of? Machine quilting larger quilts on my basic sewing machine. Teeny tiny pieced and/or hand appliquéd or hand quilted quilts. Just do it and don’t worry about it being perfect! Lisa is the current Treasurer of the Minneapolis Modern Quilt Guild. I moved to Minnesota from Ohio in 1986, and other than a few years in WI for college and a six month stint in Jamaica, I have lived here ever since. My husband Ted has been very supportive of all of my "endeavors" and is starting to develop a pretty solid understanding of quilting terms. We have two daughters who are 6 and almost 8. They dabble in sewing now and then. We also have two smelly but lovable dogs. I have two Etsy shops. 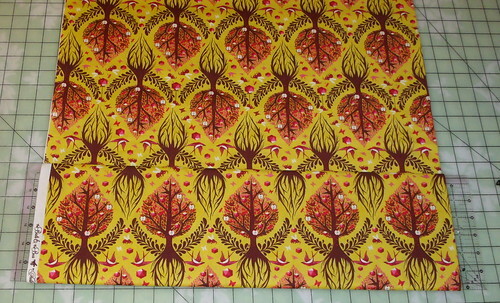 I sell finished sewn products in Pixiespit and fabric yardage in FreshStash. I also have a blog called pixieSpittings where I write about fabric, sewing and life in general. At this moment I only have dream hobbies that I would like to find time to pursue. They include international travel, reading novels, mountain biking and photography. I have been sewing since I was 5 years old. I started with barbie clothes as a child, jean patching as an adolescent and moved to quilting as an adult. My Mom and her quilting friends taught me how to quilt in 1996 and once I had a handle on the basics, I started breaking their rules. They never understood why in the world I used so many solids! 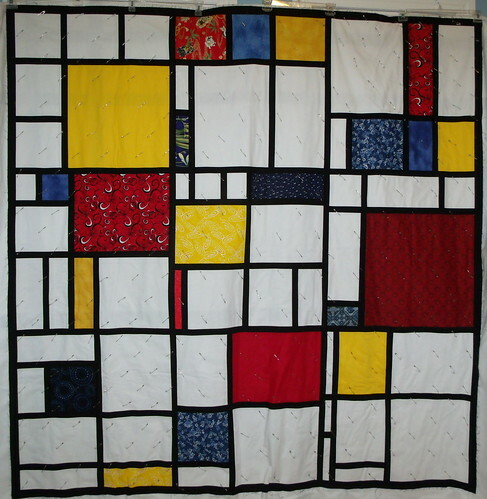 I have made more than 100 quilts in the last 16 years. Most of them were very simple baby quilts that I gave as gifts to friends and family. After a solid effort to eliminate my UFO's, I am proud to say that I have zero! Lately, I haven't spent too much time quilting. Once the kids go back to school in the fall I plan to make at least a few of the quilts that are floating around in my head right now. 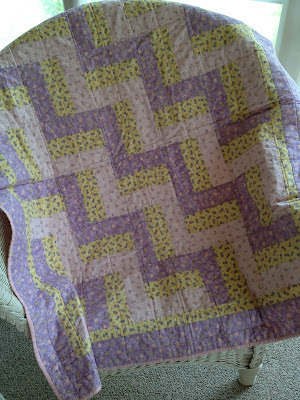 My first quilt was a nine patch with the least hideous fabric that I could find in 1996. I am SO glad the fabric world has changed since then and we now have more choices than I could have ever imagined to work with! My most favorite quilt is always the one I am currently working on. That excitement of starting something new is what keeps me at it. I am so grateful to have a fantastic new sewing space to work in. It was a dream of mine for years to build a garage with a studio space above it and that dream came true this summer. I'm still getting settled and having fun trying to decide where everything should go. One splurge I made in the new space was some fantastic speakers. iTunes DJ is my best friend most days. 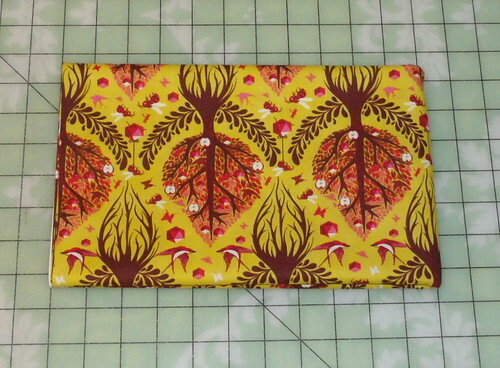 Since I started my Etsy fabric shop, I haven't been able to justify too much shopping for any other fabric. I do still love to go to brick & mortar shops in town and see what else is out there. We are so lucky to have so many great shops in town! My favorite part of quilting is the moment when something new starts to take shape. The pieces of the puzzle suddenly fit together and it makes sense! My least favorite part of the process is the actual quilting. I have never free-motion quilted a quilt. I have never even tried it on scraps. That is how afraid I am of it!! I am also afraid of zippers. I am most inspired by other quilters. I have really enjoyed being part of a guild and participating in challenges. I love to get pushed out of my comfy box and try something new! 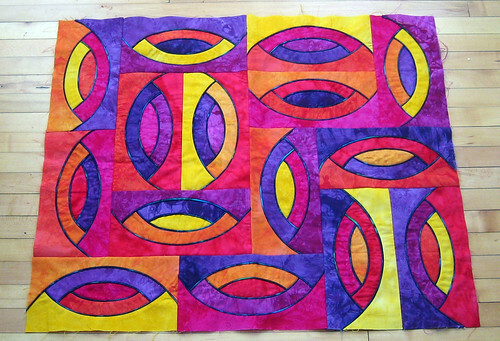 My best advice for all quilters is to ignore the "quilt police". There is no one right way to do anything. The way that works best for you IS the right way. Experiment with different techniques and stick with what works best for you. 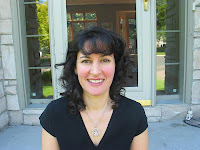 Flaun is the current Secretary of the Minneapolis Modern Quilt Guild. By day, I'm an executive assistant at a PR firm, by night I am the frequently confused and/or exasperated mother of a teen-aged girl and partner to a scientist. Our two cats keep us heavily supplied in fur, tracked litter, and love. I grew up in Central Washington with horses, scads of outdoor cats, a couple of dogs at a time, and the occasional hand-caught horned toad. (I would always release them when they got too skinny.) Until about 11 years old, our closest neighbors were 5 miles away. That made for a lot of imaginative play time, which my 5 1/2-year-younger brother didn't necessarily appreciate. My teens were spent in Eastern Washington, but Western Washington always felt like home to me. 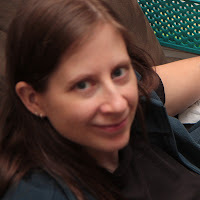 As an expecting mother, I moved to be closer to my own mother, who had a year previously gotten a new job and relocated to Vancouver, WA (basically a Portland, OR suburb, though most residents wouldn't thank me for saying so). I've also lived in Texas and the DC area. 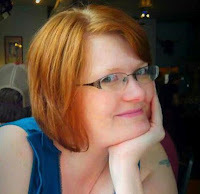 My blog can be found at http://ipleadquilty.blogspot.com/ (that just rolled over 10,000 hits!!!) and I have a Flickr photostream at http://www.flickr.com/photos/ipleadquilty/. 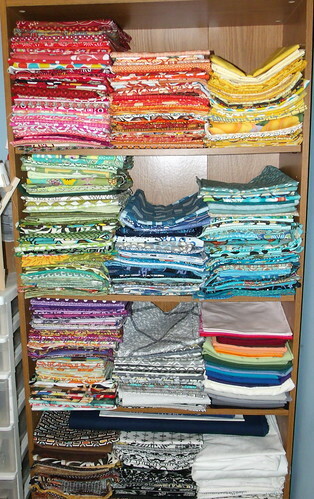 My honey keeps telling me I should set up an Etsy account, but it's so hard to make a living with finished quilts. Maybe some day, I'll publish a pattern or two. I have created a few commission pieces for clients who sought me out, specifically. My grandmother started teaching me how to sew when I was around 10. The first thing I made was a shirt for my little brother, though I think Grandma may have really done the bulk of the work. My mom frequently sewed garments while I was growing up, because, as I'm sure you know, quality clothing is either hard to find or really expensive. She helped me with a few bits of clothes here and there, when I got the urge to stitch for myself, and I even made my own prom dresses. It sounds impressive, but I really wasn't that great at it. 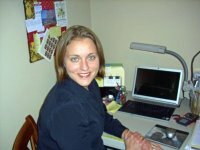 I first began quilting back in 1997, but running after a little girl was too exhausting and I put it on hold, for the most part, until September 2009. Since then, I've been going like gang busters! With basic garment sewing under my belt, I've mostly taught myself how to quilt, though I have taken a couple of FMQ classes. Isn't asking about UFOs kind of like a woman's age or her weight?! Yes, I have the dreaded UFO or two in my closet. 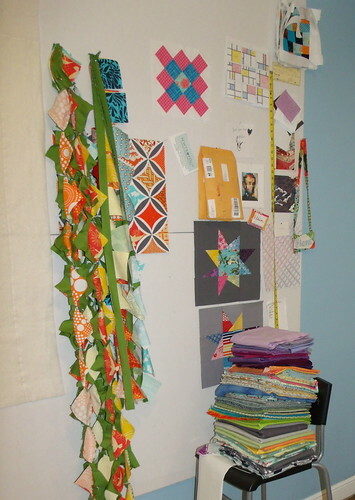 There are just so many ideas in my head, I have to jump to the next, but I keep thinking about the flimsies and half-finished quilts, coming back to them to finish one, occasionally. 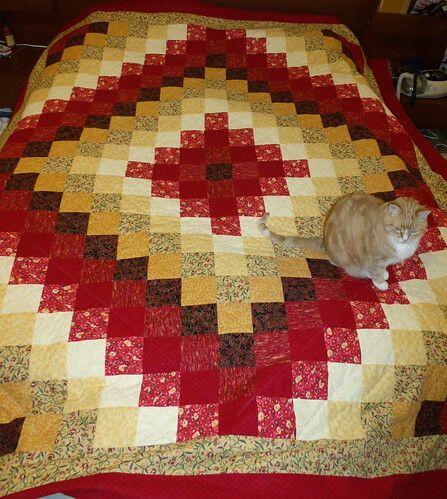 In fact, just a couple of months ago, I completed a hand-quilted Around the World quilt started about seven years ago. Interestingly enough, the top only took one day to put together. 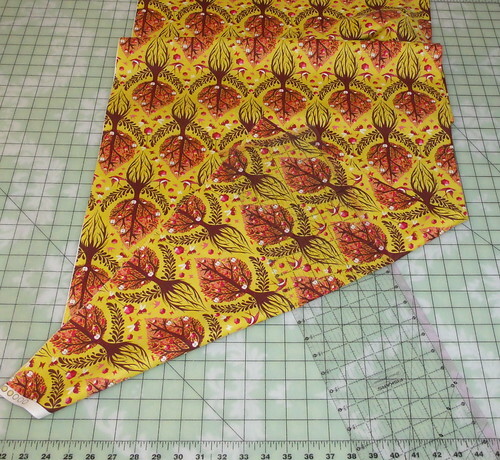 This was the first one I tried to machine quilt, but even using a walking foot, I had a LOT of wrinkles, so I tore out all the stitches and began hand quilting. I've made somewhere close to 40 quilts of varying sizes, with at least 3/4 complete. That's not too bad! Right? That's so hard to gauge! Some weeks, I'm too exhausted to do anything other than fall asleep on the couch after dinner, others, I'm completely obsessed and work myself into the ground on something that has lit a bonfire under my behind. I guess if I'm forced to average, it works out to about 15 hours a week. Yes, that's a lot - and only an average! There's a reason my house is a little grubby. I'm just not Wonder Woman. 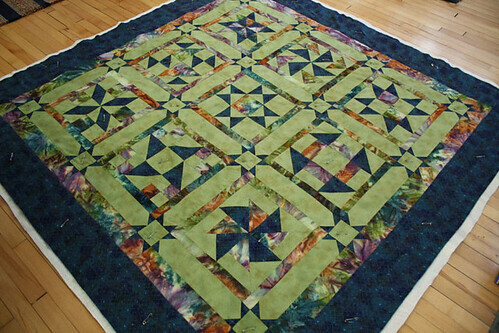 My first quilt was a beautiful Around the World in muted oranges, reds, and greenish-blues for my mom. I picked all her favorite colors and knew it was for her the whole time. I hand quilted it because I thought that was what "real quilters" do. It really was lovely, though traditional, when done. I don't have a picture, unfortunately, and it wouldn't look the same, now, as it has been the dog's blanket for years. I'm a bit outraged, frankly, and tell her all the time, but she loves that stinky dog, so I guess it's not much different than giving a baby a quilt, right? Mondrian Dream has been very challenging for me, interestingly enough. It isn't about construction or technique, since that's all very straight-forward. I mentioned once or twice on my blog that it took me a long time to wrap my head around the design so that I felt I wasn't doing Piet Mondrian's art a dis-service. I'm really proud of the result. It looks just like tiled Mondrian pieces, to me. I hope you think so, too. 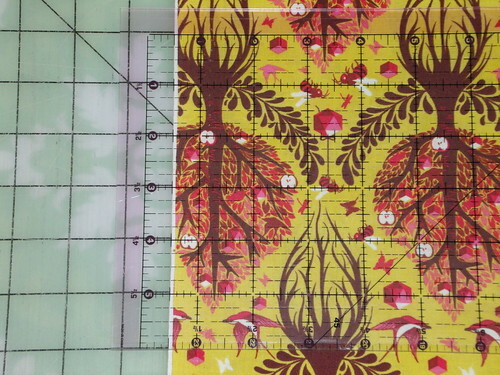 I'm taking my time quilting this beauty. I am lucky enough to have my very own studio. The windows face south, so I get a lot of light when the sun is shining. Unfortunately, when it's not, I turn on 4 lamps, a ceiling light, the regular sewing machine lights, and an extra LED stuck on my sewing machine just so I can see what I'm doing. It makes for a hot room. I've been known to open the windows during a snow storm to cool off. On one wall, I have a gorgeous pickle dish/double wedding ring that I visited three times in a Stillwater antique shop before deciding it was worth every penny of the asking price and talking my pocket book into coughing up the scratch. Under/in front of that sits a dining room table, for which we do not have any proper room, covered by a large cutting mat. On the other side is my heavily-used design wall with the ironing board and prized Rowenta sitting close at hand. I have an entire book case full of fabric, which I am currently re-folding and re-organizing, plus a chair full of the recent additions and fabrics I've pulled for various projects. (Look for it soon on the MMQG blog!) There's plenty of room for friends to come play with me and I promise to straighten up if you come over. I like to "watch" movies or TV shows (either streaming or DVD, no cable) while I sew. If I can't find anything I'd like to watch, though, I'll turn on The Current or play music from my iPod - silence is not good for my creative activities. When I'm doing free motion, I find a good drink - wine, beer, or mixed - helps loosen me up. 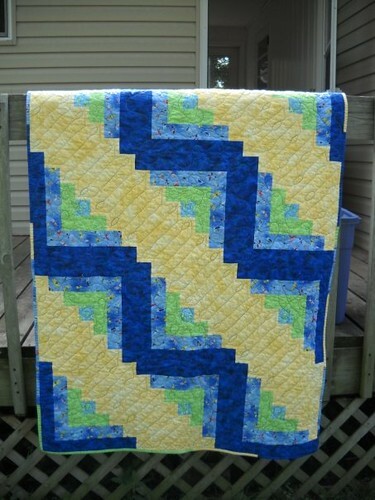 Of course, I don't advocate drunken quilting, unless you're into the uber wonky look. As of the beginning of 2010, I had no stash. It built rather quickly (with visits to S.R. Harris, various online shops, and LQSs) and I've now attempted to put on the brakes. 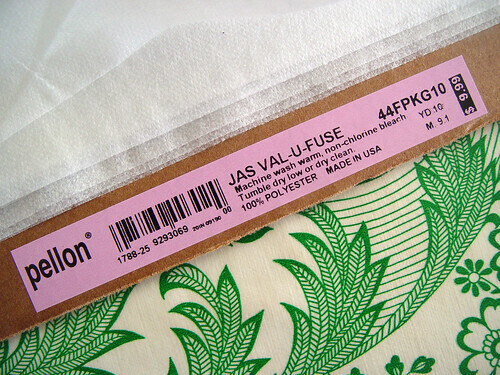 My resolution this year was to only buy solids or fabric necessary for finishing a project, in the off chance I didn't have the right type of print in my stash, already. I have faltered, but only for prints I absolutely love and cannot live without. I don't tend to buy less than a half yard of fabric and, for those that I really love, I have been known to buy 2-3 yards. I also buy bolts of the solids I go through the most (Kona Medium Grey and White). I guess what I'm saying is that my stash "management" has mixed results. I'm going through it right now, re-folding, taking out prints I don't love any more, and reorganizing everything. Let's see... My favorite thing about quilting is that at the end of a really satisfying creative process, there's this functional piece of art sitting on my couch or bed. I really love the process of designing the quilt, seeing it take shape and morph while piecing, and the first pull out of a fresh dryer is sublime. My least favorite part is definitely basting. It hurts to crawl all over my hardwood floor pinning quilts. I can't do it well on my table, as most quilts I make are a functional size and not wall hangings, so floor it is. After hours of smoothing, layering, and pinning, my back, knees, shoulders, and head ache. I've tried to enlist basting help from my daughter and partner, but my partner usually has better things to do and it takes more energy to convince my daughter to help me for 1/4 of the quilt than it does to pin baste it myself. 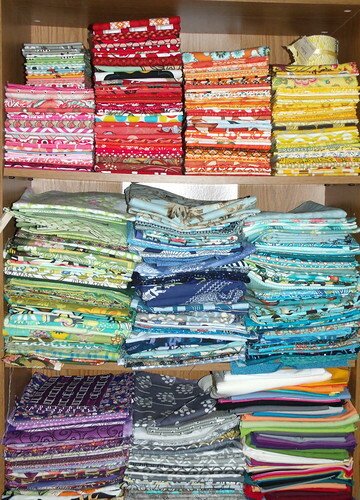 If only I could get through every quilt I have in process today, I would be a happy woman! Other than that (which is completely unachievable), my only goal is to have fun and try to learn a little more every year. I would love to be better at Y seams. I've done them a few times with less than stellar results. Any tips for me? Architecture really inspires me, though I rarely get around to finishing a quilt that was inspired by it, strangely enough. Don't dwell on every little thing you see as "wrong" in your work. It is a process. 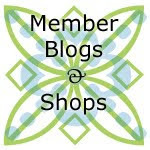 You will improve and chances are, unless they are a jurist for quilt shows, the people you share your quilts with won't notice where you went wrong unless you tell them. Don't tell them. Take all advice with a grain of salt, whether quilting or life. Don't worry about the quilt police or what "they" say. Enjoy every little bump and mistake that leads to something beautiful. And remember, if you're not having fun, you're not doing it right. I am not perfect, no matter how it may seem on my blog. My studio is usually messy (see me keepin' it real above) and I still make lots of mistakes while sewing, but tend to roll with the punches. Sometimes, a misplaced bit of fabric really makes a modern design pop. Embrace the unexpected in your work. You never know when it may take a piece to the next level!